Outside of Germany, I think Italy has more metal bands per square mile than most countries of the same size. 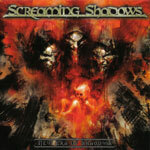 Screaming Shadows is another metal export in the classic heavy metal tradition with a touch of power metal thrown in. 'New Era Of Shadows' is their third full-length release. Fundamentally, after one listen I could tell that Screaming Shadows is built around lead guitarist Francesco Marras. On every song, he is given substantial time to stretch and soar in his solos. His technique is nearly flawless; his expression vibrant and creative within the neoclassical tradition. He impresses on 'New Era Of Shadows,' 'The Way Of The Warrior,' and 'Lady Hawk.' Actually, I would suggest Screaming Shadows would be just another average metal band if not for Marras. Though their arrangements can be clever at times, witness 'Break The Chains,' 'Point Of Light,' or the Maiden-like 'What The Hell I Goin On,' this is generic old school/NWOBM stuff. Overall, if you like your metal in the classic vein, nearing NWOBM, and built around stunning guitar work, you will love Screaming Shadow's 'New Era Of Shadows.' It's a solid and generally satisfying work. Recommended! If you like your metal in the classic vein, nearing NWOBM, and built around stunning guitar work, you will love Screaming Shadow's 'New Era Of Shadows.' It's a solid and generally satisfying work.